NEW YORK — Curator Rebecca Pristoop begins her essay for Devotion/Destruction: Craft Inheritance describing a mysterious “happening”, a human intervention ending with the destruction of a delicate object destroyed by its maker. The floor is strewn with broken glass and masses of torn yarn, clumped and unraveling. Something happened here. Something happened that transformed a contained structure -an evenly crocheted web with an assertive shape- into a menacing heap of razor-sharp scatter. Disruption happened. In the rooms of Dorsky Gallery Curatorial Programs for Devotion/Destruction: Craft Inheritance, there are “happenings” everywhere, vestiges of an archeological site rife with evidence of the genius, playfulness and destructive nature of humanity. Contradictions abound in each work between the maker, the materials and the space and although a serene palette is dominant, destruction is pervasive in the making or the meaning. 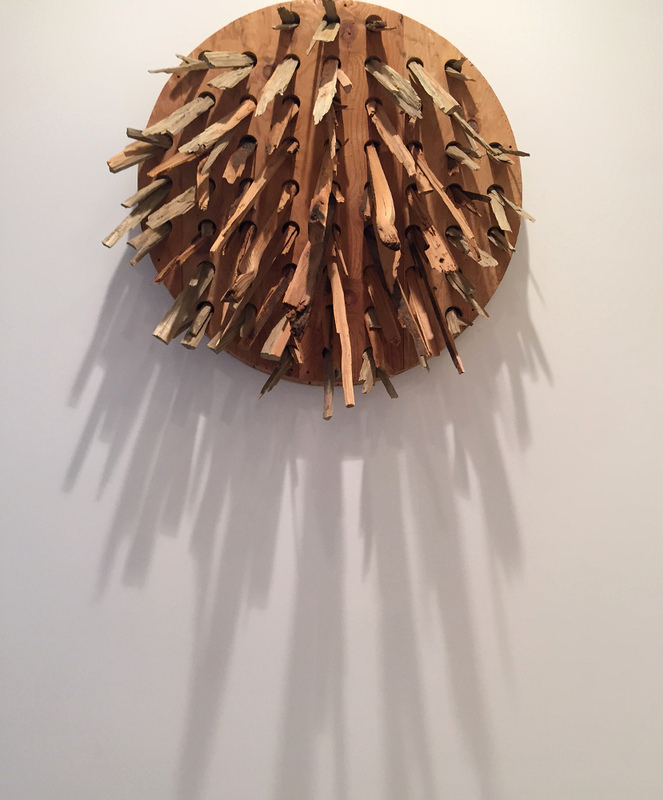 Colby Claycomb, Soft Kiss of Sunrise, 2014, Lumber, plywood, 40 x 46 x 58 in. The gallery is a beautiful space and Pristoop made wise choices in the placement of each work. Positioned above the threshold of the exhibit, as a harbinger of coming disorder, is Colby Claycomb’s foreboding sculpture Soft Kiss of Sunrise, 2014. The structure belies its title. Flotsam and jetsam wooden shards, like the remnants of a shipwreck are staked into the heart of a wood circle creating rays of splintered lumber, sharp and untouchable that spill jagged and dangerous shadows on the wall. You note its presence, but are enticed further into the first room by the glittering works of Armita Raafat and Alexandra Ben-Abba. 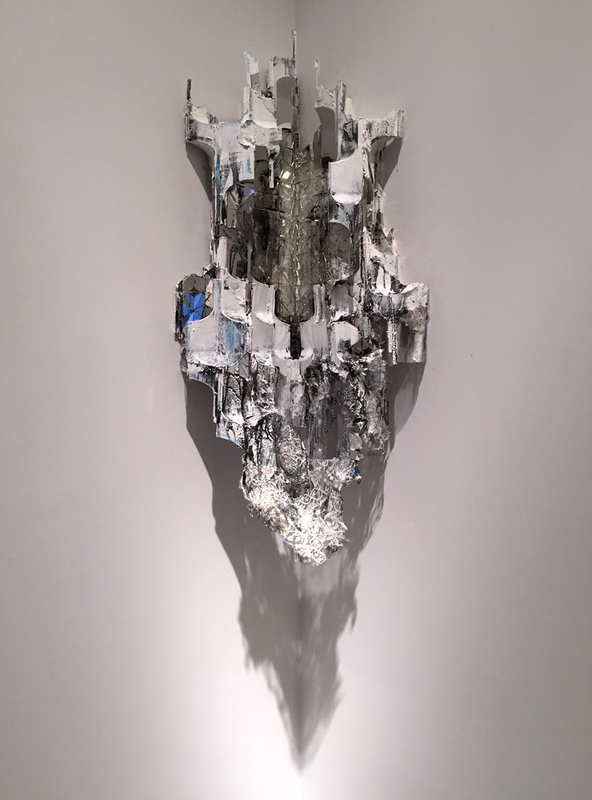 Armita Raafat, Untitled, 2015, Plastic, resin, paint, mirror, cardboard, pigment, sumi-e ink, 45 x 7 x 21 in. 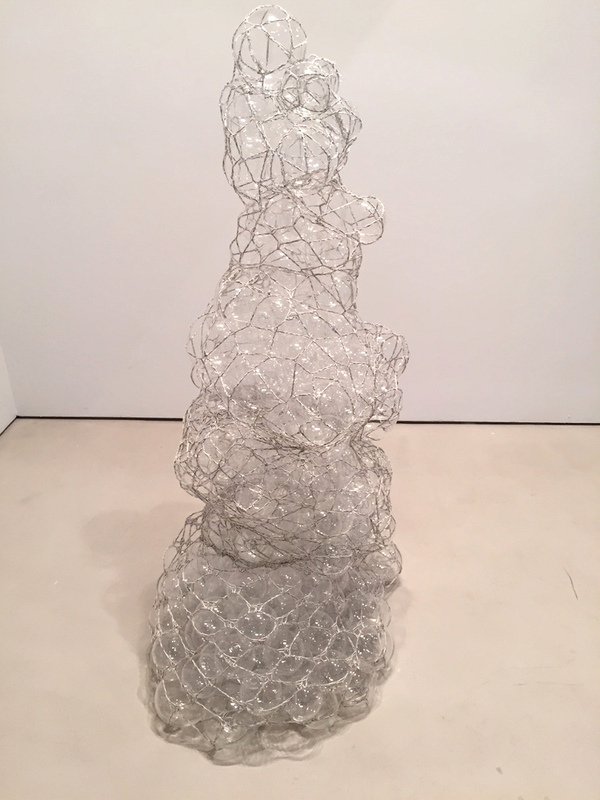 Alexandra Ben-Abba, Disruption, 2011/2016, Glass, reflective yarn, Dimensions variable. Armita Raafat’s, Untitled, 2015 juts out of a corner like a new-found artifact recently unearthed and Ben-Abba’s Disruption, 2011/2016, made of blown glass spheres held together with string lies on the floor witnessed in its early stage, before it becomes a performance for the artist, before its destruction. Disruption cries to be toyed with and screams of the dangers that will befall the tempted one who dares to play with it, creating tension with reason. 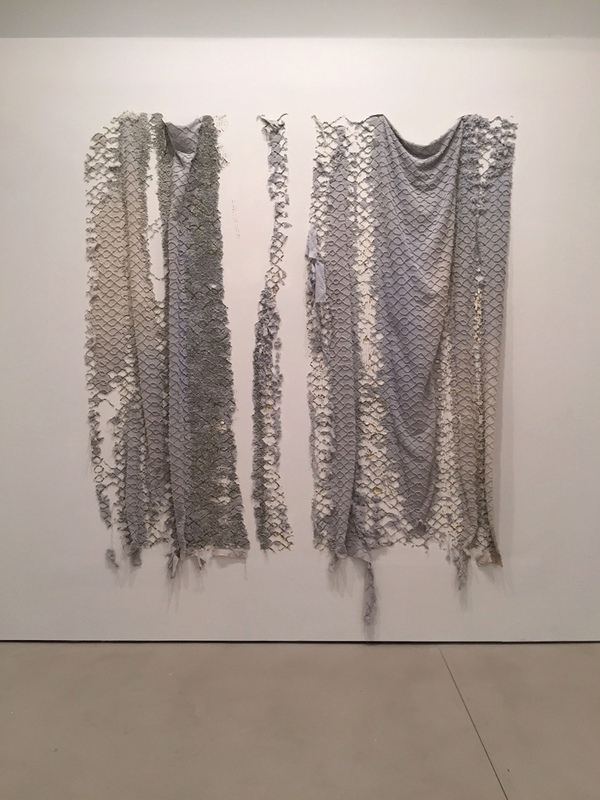 Elana Herzog, Untitled (Chainlink Drapery Study), 2004, Chenille bedspread, metal staples in reinforced, painted drywall panel, 100 x 86 x 3 in. 41 x 48 x 2 in. Elana Herzog’s work is made with an exhaustive amount of brutal, cathartic, physicality that is only revealed upon closer inspection. A first glance of Untitled (Chainlink Drapery Study), 2004 brings to mind the craft of couture fabrics, on display for their fine handwork. Soft, shiny and seductive you are pulled in to find thousands of staples passing as sequins or beading, undermining the senses and what is familiar with a spirit of confusion and awe. 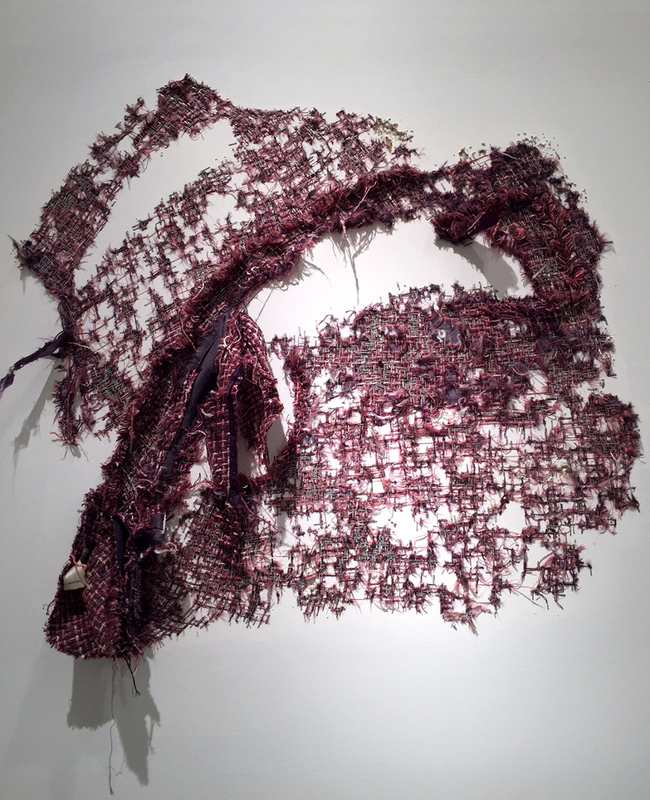 Untitled Purple Jacket, 2008, is so punctured, pulled and worked over that there is no semblance of a jacket and the fabric becomes an inlay to the wall. Herzog’s materials are assaulted in the making, yet she yields to the beauty that survives her aggression. Alyssa Cassey’s works are luminous paper structures, masquerading as fabric forms hanging on the wall and placed on the floor. Friendly, luminous and winsome they beg to touch even though forbidden. The viewer sees a soft object and is once again fooled by the materials. Comfort may be found in discovering the paper is made with cotton and pine wherein your senses again become engaged in a deception that pleases with the fresh and familiar. Alyssa Casey, Let Go (Per Teresa A Roma) 2012, Handmade cotton/pine paper, Overall installation dimensions variable. It is fitting to find Cheryl Ann Thomas’ works in conversation with Cassey’s. Again you are deceived by the maker’s use of materials. Resting on the floor, Violet, 2014, takes on the form of a Fortuny silk dress released from a body, fallen to the ground in a pool, stepped out of and left by a wearer who has moved on. 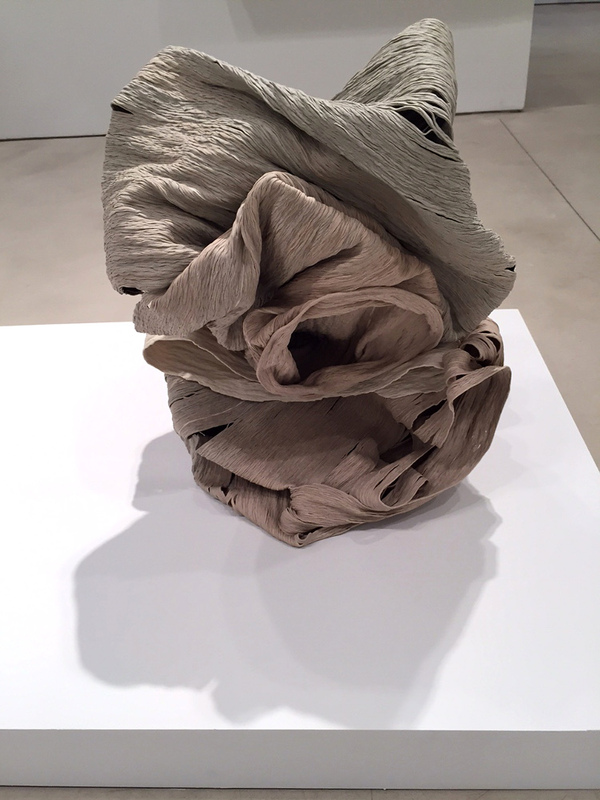 Thomas’ material is not silk, but ceramic clay, coiled into a vessel and fired in a kiln where it collapses into a beautiful heap. 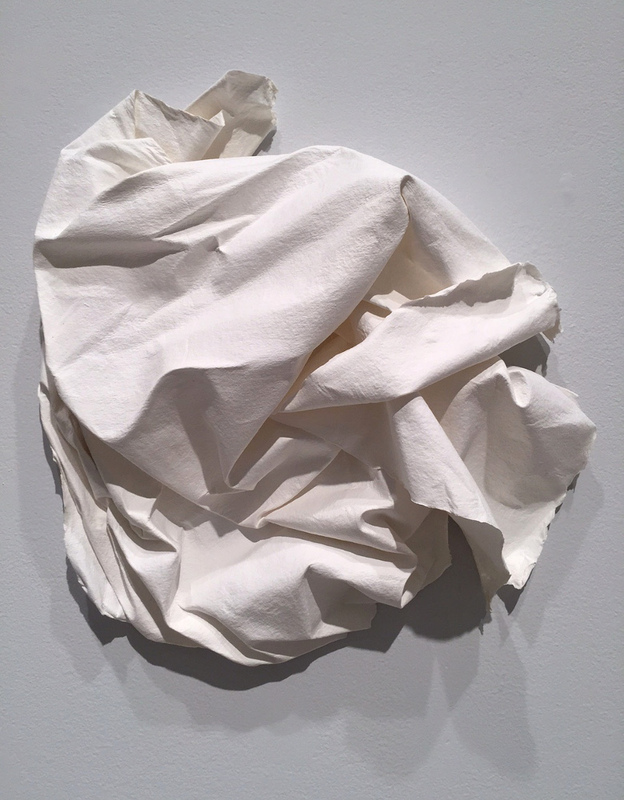 Cheryl Ann Thomas, Violet, 2014, Porcelain, 19 x 21 x 18 in. Joan Lurie’s ceramic works stand sentinel in the room and act as vessels of empty space, exo-skeletons defining the negative, formed by cutting away from a traditional ceramic form. The artist’s reductive process creates a series of apertures of varying degrees that harmonize with each other and miraculously do not compromise the structure’s integrity. 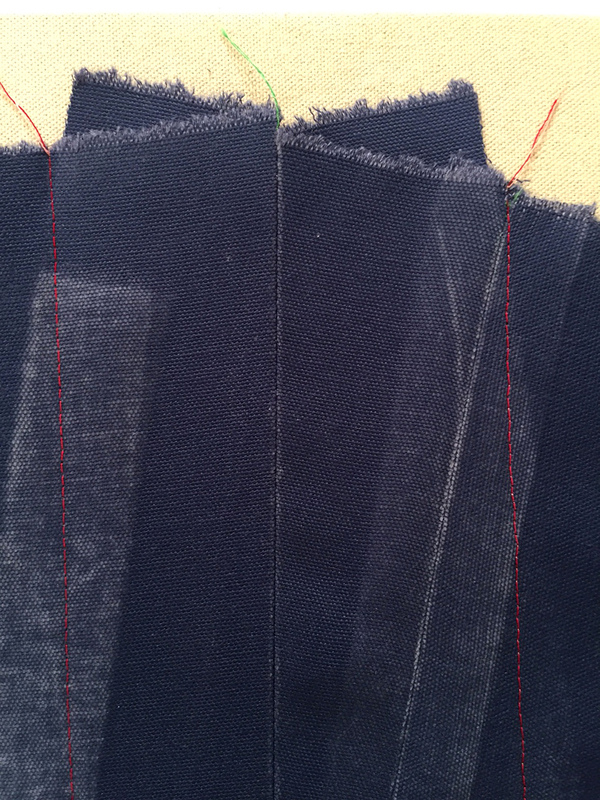 Contradictions and connections persist in realizing Michael Milano’s works are not paintings, but minimalist quilt works, fooling the eye with fabric folded and ironed, finished with sparse line elements of strategically placed stitching. Simple and stunning. These objects flank Crystal Gregory’s window of falling lacework made of solder and glass. 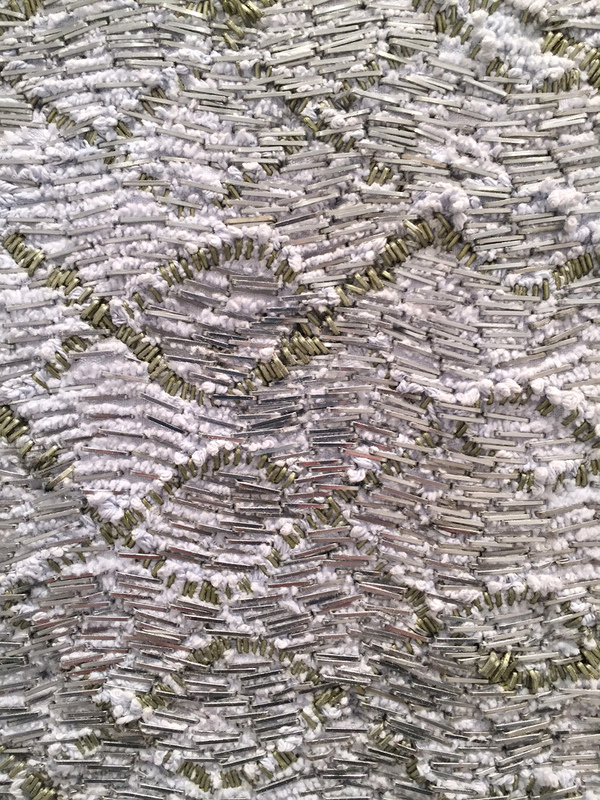 The artist’s play with the premise of textiles, using traditional building materials, creates a form that evokes a vision of an architectural gem wrested from the ruins. 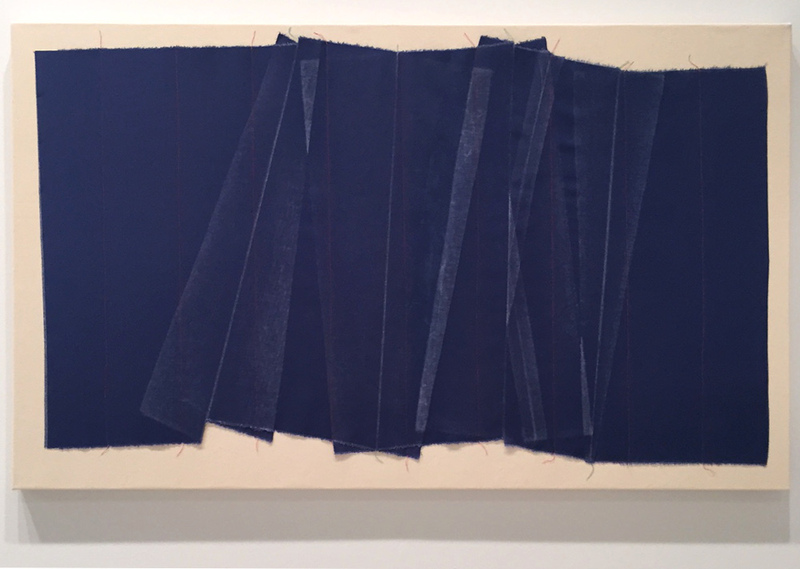 Michael Milano, Pleats, 2015, Canvas, thread, 32 x 52 in. 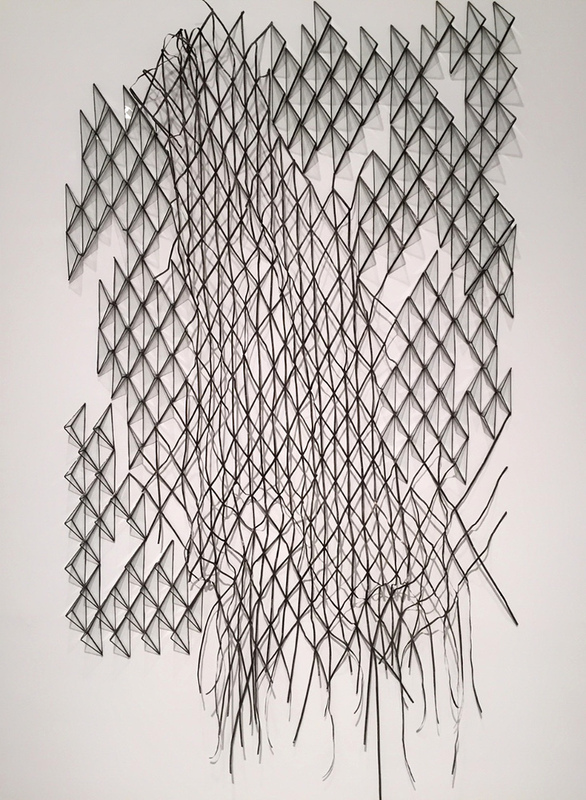 Solder, glass, 72 x 48 in. Finally, the exhibit ends with a video of John Paul Morabito engaged in the ancient craft of weaving, warped into the present by pixelating the moving images into a digital grid. Simple movements, multiplied, in unison and looping just like the weaving process that builds on a grid, replete with the sounds of the maker that give the room its heartbeat. Pristoop’s thoughtful curation and careful placement of these beautifully made objects can only come from the mind of a listener, a listener of the heart and the soul of a lover, a lover of history, humanity and craft. She brings together disparate objects and finds a way to meld their young histories into a story of the cultural inheritance and significance of craft. Each object is made with devotion to process and materials and the early life of each work has been violated by a destructive force that brought it to its mature state. Some lose ground to violence, erosion or gravity, others emerge from past lives and become something new and others lie dormant in a frozen state on the verge of collapse, waiting for one more offense to undermine its structure, all of them at once proud and clinging to dignity. The sacred realm of human labor is respected here, this place of “happenings”. IMAGES by the Author, 2016.